UK retail sales volumes fell by 0.8% in February compared with the previous month, figures from the Office for National Statistics have shown. The decline was bigger than expected, but sales volumes over the past three months were still 1.7% higher than the same period a year earlier. Internet retailers fared best, with 10.7% of all sales now made online. January's unexpectedly strong growth in sales volumes of 0.9% was revised down to 0.3%by the ONS. Sales volumes figures strip out the impact of inflation. 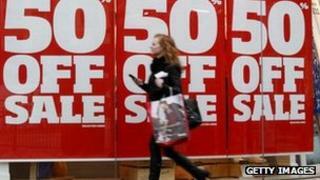 Analysts suggested that February's figures were further evidence of the continued squeeze on consumers. "It's not just that the February numbers are weaker than anticipated, but January is also heavily revised down," said Peter Dixon from Commerzbank. "The hoped-for recovery [in] consumer spending certainly doesn't look to be there." An Ernst and Young economist described the overall picture as "robust" and suggested that the poor showing in February was not surprising. "Factors such as heavy discounting were supporting volumes over the past couple of months," said Nida Ali, economic advisor to the Ernst and Young Item Club. "This was clearly unsustainable and it was only a matter of time before weak economic conditions took over." Earlier, Next, one of the UK's biggest clothes retailers, reported strong profits for 2011, but said the outlook for the year was "very uncertain" because of poor employment prospects and the lack of availability of credit. However, it welcomed the slowdown in the rise of the cost of living and predicted that this should continue to ease in 2012. Some of the biggest sales falls were seen in clothing and footwear, where sales volumes were down 0.4% in February, the ONS said. Sales in food stores were 0.1% lower than January, the ONS said, but 1% higher in February than a year earlier. Overall sales volumes were also 1% higher than in February 2011. This increase over the year was described as "very good", with one analyst forecasting that consumer confidence would recover in 2012. "February was the only month we've had bad weather really this winter and so the comparison is with a month when the weather was a little bit better," said Richard Perks from Mintel. "Although this year's going to be quite tough, the next stage is going to be a modest improvement. And of course also this year we've got the Jubilee and the Olympics, which are going to be great for consumer confidence."